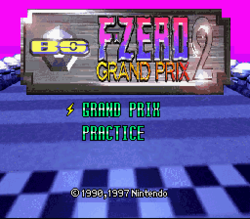 BS F-Zero Grand Prix 2 is the second Satellaview-exclusive variant of the Super Nintendo game F-Zero. It features the same cars as BS F-Zero Grand Prix but has new tracks. The game features some new sound effects but is largely identical to the original F-Zero. The game originally had four Leagues (Knight, Queen, King, Ace), but currently only the Ace League is playable. This page was last edited on 3 July 2012, at 08:29.